What the hell is Ron Rivera thinking? The Panthers coach led his team in a “Mr. Richardson” locker room chant on Sunday, despite the essentially forced removal of the Carolina owner following various allegations of workplace misconduct. Panthers coach Ron Rivera decided to lead the team in a “Mr. Richardson” chant following the team’s win over the Buccaneers Sunday. The cringeworthy chant came only a week after Panthers owner Jerry Richardson announced he will sell the team at the end of the season following reports of a number of sexual harassment allegations made against him. The video was uploaded to the Panthers’ team website. It has not been removed. 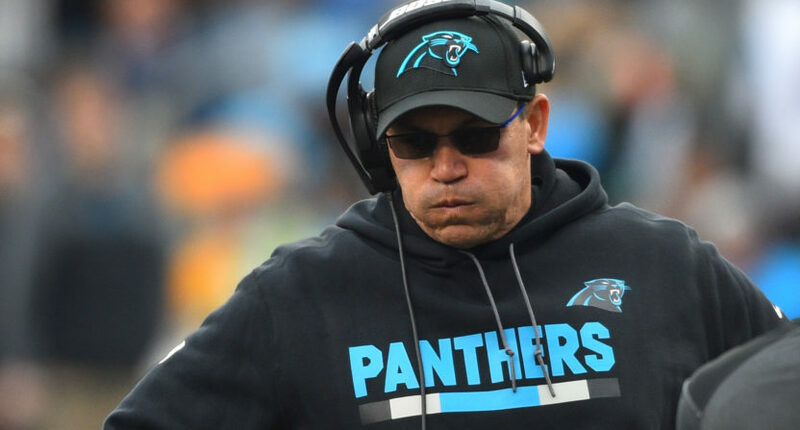 Considering the racial overtones of some of Richardson’s misconduct, encouraging your players to chant “Mister Richardson” is a pretty misguided thing to do, regardless of how Rivera may have been personally treated by Richardson. And that’s not even touching the obvious issue of the sexual misconduct reports, and how this looks to women both inside and outside the organization. Rather than acknowledging the sensitivity of the situation and perhaps even admitting he made a mistake, Rivera decided to dig himself further into the trenches with Richardson (Richardson, of course, was likely fine letting someone else do the manual labor for him). Panthers players expressed similar sentiments about Richardson last week following the explosive Sports Illustrated article that alleges the Panthers made four substantial financial payouts to former employees to settle claims of workplace misconduct by the 81-year-old Richardson. Middle linebacker Luke Kuechly said the best way to send Richardson out would be to win a Super Bowl. Rivera’s attitude is part of the problem; no one does this kind of thing out in the open for all to see, although apparently Richardson was just about as close as you could get to that. It’s trademark dismissal of accusations, and it’s not even taking a wait-and-see approach (although Richardson being forced out should be enough evidence on that front), it’s being forceful in your assertion that Jerry Richardson is a man worth celebrating. How is the NFL so bad at this?